Joshua Tree National Park is located in southeastern California, roughly 2.5 hours northeast of San Diego. It’s only been a U.S. National Park since 1994, but it was designated a U.S. Monument in 1936. The park was named after its abundance of native Yucca brevifolia, or Joshua trees, as most people know them. Its unique landscape merges two specific desert ecosystems – the Colorado Desert and the Mojave Desert. Visitors come for its fascinating blend of flora and fauna as well as outdoor activities like rock climbing, scrambling, and hiking. You’ll find a range of accommodations at Joshua Tree National Park, ranging from quaint bungalows to private cottages to modern condos. Here are 25 of the best. Located just a few blocks from downtown Joshua Tree, California, The Starlight Villas of Joshua Tree offers travelers a luxurious lodging option with plenty of modern comforts. This high-desert retreat features six unique villas that offer fully equipped gourmet kitchens, complimentary Wi-Fi, and high-end central air with temperature control. Whether its the Casa Aqua or The Monet Suite, each accommodation features opulent finishes like private bathrooms, plush bedding, chic furniture, and private patios with BBQs. Guests will appreciate being close to attractions including Joshua Tree National Park, Morongo Casino Resort & Spa, and the Amboy Crater National Natural Landmark. For travelers who want to be close to Joshua Tree National Park or the Marine Corps Air Ground Combat Center, Blue Sky Resort is ideally situated for both. It’s only a few minutes’ drive to the base and about a 10-minute drive to the north entrance of Joshua Tree. For a fun evening, Smith’s Ranch Drive-In movie theatre is right down the road, or perhaps guests will try their luck at the Tortoise Rock Casino. The resort offers spacious one and two-bedroom cottages that are fully furnished. 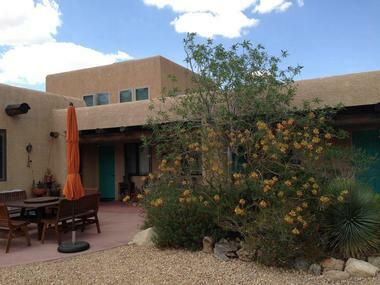 They have flat-screen TVs, full kitchens, and private patios with beautiful mountain views. Travelers are sure to have a one-of-a-kind experience at this unique desert retreat with its intimate connection to the Mojave. 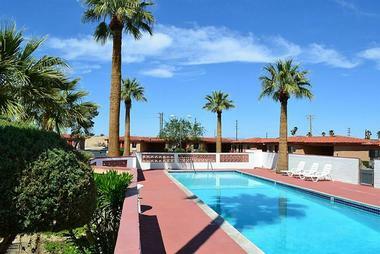 Situated on the Oasis of Mara, 29 Palms Inn is located in Twentynine Palms, California. Guests will appreciate the hotel’s close proximity to Joshua Tree National Park, as the north entrance is only a 5-minute drive away. Visitors can hike incredible nature trails or indulge in world-class bouldering and climbing. 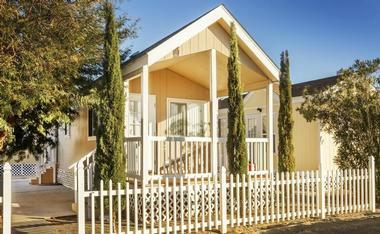 Accommodations range from 1934 adobe bungalows to wood frame cabins to vacation rentals. All of the rooms have private bathrooms and air conditioning. Hotel amenities include a pool and Wi-Fi in common areas. 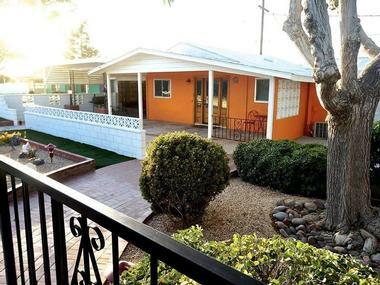 9 Palms Inn offers a wonderfully colorful Mojave Desert retreat option for travelers who have made their ways to Twentynine Palms, California. This charming boutique motel is located just blocks from downtown, and about a 5-minute drive to the north entrance of Joshua Tree National Park. 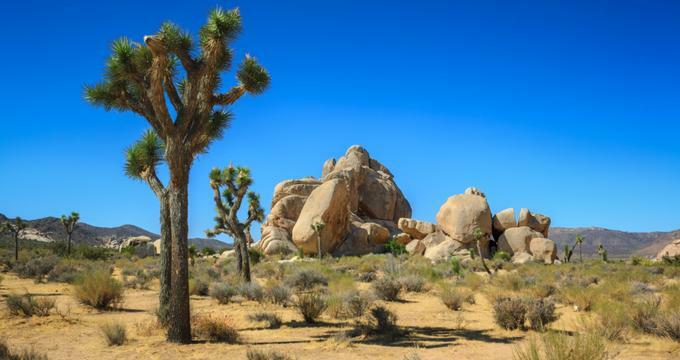 Joshua Tree offers nearly 800,000 acres of serene desert landscape to be explored where guests can take a ranger-led tour of historical homesteads and gold mines. 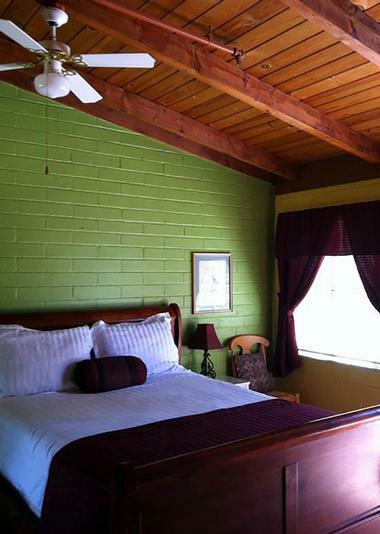 The rooms have beige tile floors and bright wall colors like yellows, greens, purples, and blues. Room amenities include private bathrooms, Wi-Fi, and flat-screen TVs. Some rooms have kitchens. 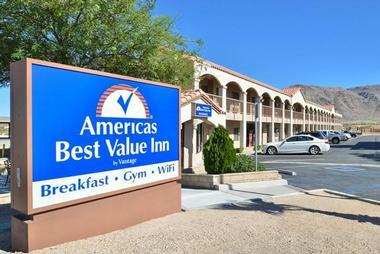 America’s Best Value Inn is a low-budget, no-fuss option for travelers in the Twentynine Palms area. This hotel is especially nice for families traveling with children 11 years old and younger, as they stay free when sharing a room with their parents. Guests staying here will be only a few minutes’ drive from the north entrance of Joshua Tree National Park and downtown Twentynine Palms. 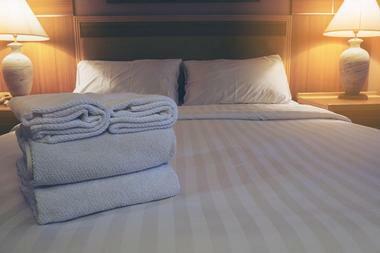 The rooms have a clean and contemporary look with navy-blue carpet, beige walls, wood fixtures, and elegant bedding. All rooms have private bathrooms and flat-screen TVs. Hotel amenities include an outdoor pool, fitness center, and complimentary breakfast. The Best Western Joshua Tree Hotel & Suites offers its guests a comfortable and unique experience when visiting Yucca Valley, California. Travelers will be able to easily reach area attractions that include Joshua Tree National Park, Joshua Tree Retreat Center, and Morongo Resort and Spa. For the best golf and shopping California has to offer, Palm Springs is a 30-minute dive away. The hotel offers several fun themed rooms like Rockin’ Fifties, Cave, Desert Oasis, Jungle, Safari Suite, New York New York, and Tahiti Suite. Rooms include cable TV and complimentary Wi-Fi. Some themed rooms have Jacuzzis. The hotel also features an outdoor pool and hot tub. 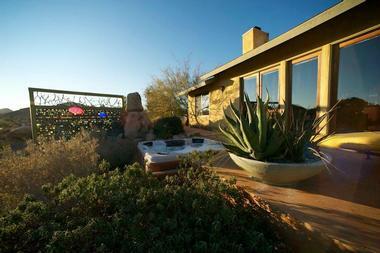 This enchanting desert oasis retreat is situated on 25 secluded acres of marvelous Mojave Desert landscape. Guests will find tranquility within the property’s lush gardens and towering Mexican fan palms. From the Campbell House, Joshua Tree National Park is easily reachable for some world-class climbing, bouldering, and hiking. After an active day outdoors, guests can return for a rejuvenating massage and spa treatment. Whether visitors choose a guest suite or a private cottage, they’ll be met with lush bedding, modern amenities, and gorgeous desert views. Guests can end the day with a relaxing soak in the hot tub under the starry desert sky. The Desert Hot Springs Spa Hotel is a classic mid-century modern hotel located in Coachella Valley between Joshua Tree National Park and Palm Springs. In 1970 the hotel was built around hot springs that formed the central courtyard guests see today. There are eight pools on the property that are fed by the restorative natural mineral waters of the hot springs. Rooms are contemporary in design and have gray carpets, beige walls, and wood furnishings. They also feature private bathrooms and cable TV. Guests can enjoy local attractions like the Agua Caliente Cultural Museum and Cabot’s Pueblo Museum. 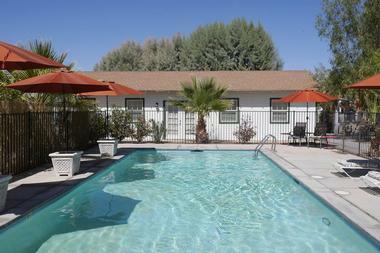 Desert Palms and Spa Motel offers travelers an excellent low-budget option in Coachella Valley. 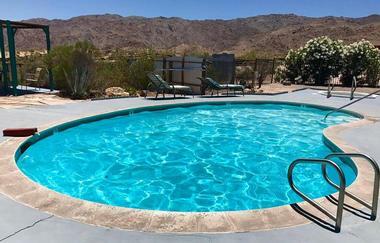 The motel is ideally situated between Palms Springs and Joshua Tree National Park. Travelers will appreciate the motel’s close proximity to a variety of attractions that include Moorten Botanical Garden, Panorama Park, and the Palm Springs Square Shopping Center. Visitors can easily take day trips to Joshua Tree National Park to explore the park’s majestic desert landscape. 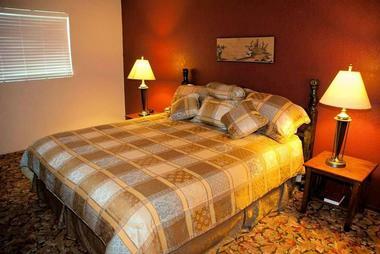 Rooms have a modern design and feature private bathrooms, plush bedding, cable TV, and contemporary wood furnishings. The motel also has a fitness center, a sparkling pool and several whirlpools. Situated just off of Twentynine Palms Highway, travelers will find the charming El Rancho Dolores Motel in the heart of Twentynine Palms, California. It’s a 5-minute drive to Joshua Tree National Park’s north entrance. Guests can easily make their way to the park and enjoy guided ranger-led tours of historical gold mines and homesteads within Joshua Tree. The rooms are spacious, bright, and feature contemporary design. Room amenities include private bathrooms, air conditioning, plush bedding, and cable TV. Rooms with kitchenettes are available upon request. Guests will enjoy cooling off in the motel’s sparkling and inviting pool after a day of exploring. Fairfield Inn & Suites Twentynine Palms is ideally situated for travelers who want to explore Joshua Tree National Park. Located in Twetnynine Palms, California, travelers staying here will also have convenient access to attractions like Noah Purifoy’s Outdoor Desert Art Museum and the Mohave National Preserve. Rooms are ultra-modern, spacious, and feature contemporary furniture and artwork. 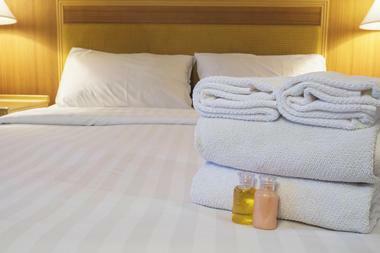 Room amenities include private bathrooms, plush bedding, large windows, flat-screen TVs, and complimentary Wi-Fi. The hotel offers guests complimentary breakfast and a 24-hour fitness center with cardio equipment and free weights. Guests can also enjoy the hotel’s outdoor pool and BBQ. Harmony Motel is situated on a 1.8-acre hilltop that overlooks the city of Twentynine Palms, California. The motel has some unique history with the iconic rock band U2 having stayed here while working on their Joshua Tree album. If this rustic motel was good enough for rock legends, it should definitely be on the list of those traveling to the Twentynine Palms area. The rooms are bright and spacious; they have exposed wood-beam ceilings and light-colored walls. They also have air conditioning and cable TV, and some rooms have kitchenettes. Guests can enjoy the sparkling pool while taking in majestic mountain views. Travelers planning a trip to Joshua Tree National Park may want to check out the High Desert Motel just three blocks from the park’s visitor center. It provides the ideal location to begin a desert exploration. Guests will also have easy access to downtown Twentynine Palms, where they can explore a variety of restaurants and shops. Day trips inside Joshua Tree offer visitors the chance to experience world-class bouldering, hiking, and mountain climbing. The rooms are spacious and contemporary in design. They have private bathrooms, flat-screen TVs, and mini-fridges. The hotel features outdoor BBQ areas and a sparkling pool with gorgeous mountain views. 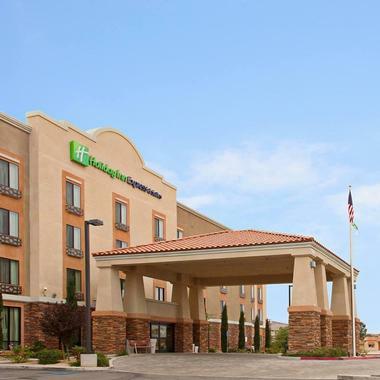 Holiday Inn Express & Suites Twentynine Palms- Joshua Tree hotel is situated right off Highway 62 and offers travelers a convenient option for exploring area attractions in Twentynine Palms, California. The Oasis Visitors Center is about 3 miles from the hotel, while Joshua Tree National Park is approximately 7 miles. Guests visiting the national park will get the chance to experience some of the best mountain biking, hiking, and climbing in the area. 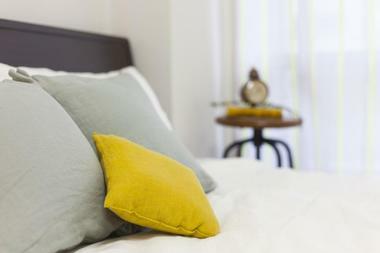 Well-appointed rooms are sleek, contemporary in design, and feature typical modern amenities. The hotel also provides guests access to a fitness center, sparkling outdoor pool, and complimentary breakfast. 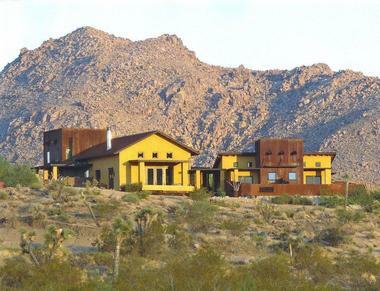 Built in 1949, this Spanish colonial-style desert retreat is situated along Highway 62 in Twentynine Palms, California. The historic Joshua Tree Inn is known for the unique, rustic, and charming lodging it has provided travelers visiting the Twentynine Palms area. Conveniently located just 5 miles from the hotel, guests can explore Joshua Tree National Park and enjoy world-class climbing, bouldering, and hiking. Gram Parsons fans will get the chance to explore the legendary room where the beloved country rock musician spent his last hours. Guests staying here will enjoy the inn’s tranquil courtyard, koi pond, and sparkling swimming pool. Joshua Tree Oasis takes finding a convenient Joshua Tree National Park accommodation to the next level. Travelers will be pleased to know that reaching Joshua Tree’s Mojave Desert grounds is as easy as stepping outside of their front door when staying here. Located in the park near its west entrance, guests will have premier access to world-class mountain climbing, hiking, and bouldering. The rooms have a desert-style design with earthy tones throughout, and provide several modern amenities. The large windows surrounding the property offer guests unrivaled and intimate views of the park. The outdoor Jacuzzi and indoor fireplace provide opulent touches. 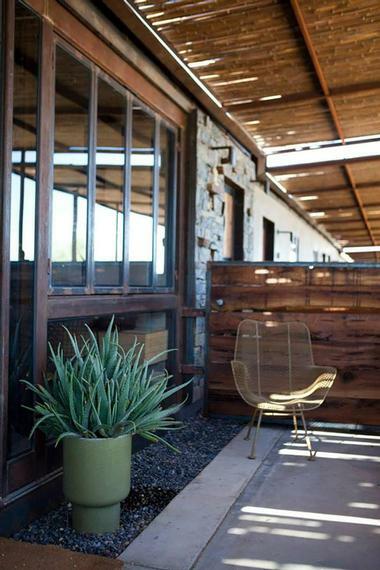 This eco-chic desert refuge was built in the 1950s and has two suites and three classic rooms. Mojave Sands is situated along Highway 62 in Joshua Tree, California. The property is enclosed by rusted metal sheets and reclaimed wood. Located in the motel’s courtyard is a large wooden dining table to enjoy a few meals, and there is a large custom reflecting pool to relax. Travelers will appreciate their close proximity to area attractions like Joshua Tree National Park and the Mojave National Preserve. Other motel amenities include an outdoor shower and tub and record players with vinyl in the rooms for guests’ listening pleasure. Rich in Hollywood history, Pioneertown Motel was built in 1946 for the biggest Western movie stars. Surrounded by rare California mesas and protected lands, the motel provides travelers with a peaceful desert escape. The motel is situated a few miles north of Highway 62 and a few miles west of State Route 247, in Pioneertown, California. Guests will appreciate how close the motel is to local attractions that include the Pioneertown Mountain Preserve and the La Copine restaurant. The rooms are charming and rustic with details like cowhide rugs, reclaimed wood-plank doors, exposed wooden ceiling beams, and tasteful Southwestern decor. Sacred Sands Bed & Breakfast is an architectural gem situated along Quail Springs Road just outside of Joshua Tree National Park’s west entrance. The hotel offers magnificent desert valley and mountain views while providing luxury lodging for its guests. Take a short drive into the park and experience world-class mountain biking, horseback riding, and hiking. The guest house sits on 5 acres and features large picture windows, high ceilings, and private patios. 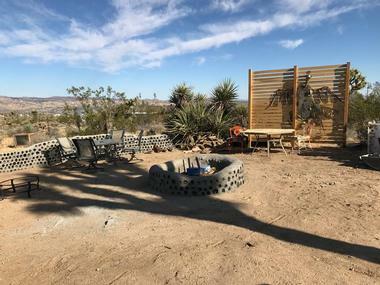 There are two rooms, the studio and the suite, and both have patios that feature mineral water hot tubs, dining furniture, fire pits, and panoramic views of the Mojave Desert. 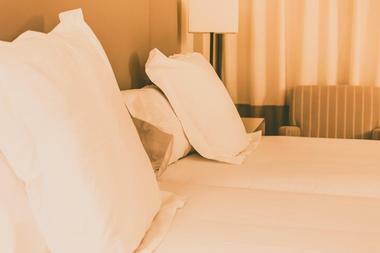 This budget-friendly motel is the perfect option for travelers who want to stay connected to the park and other area attractions in Joshua Tree, California. 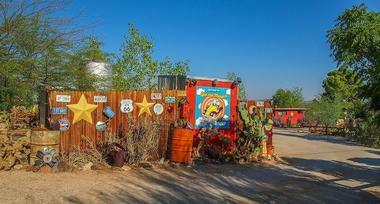 Safari Motor Inn is situated along Highway 62 and only a block from Joshua Tree National Park’s west entrance. Joshua Tree offers nearly 800,000 acres of unspoiled, beautiful high desert landscape for visitors to enjoy. Guests can take picturesque nature walks, view beautiful wildflowers, or do some birding. The motel has a pool, desert garden, and outdoor seating. Rooms are contemporary in design and feature modern amenities like TVs, coffeemakers, mini-fridges, and private bathrooms. Spin and Margie’s Desert Hideaway is a wonderfully quirky boutique hotel situated along Highway 62 in Joshua Tree, California. Guests will be close to a variety of area attractions that include Joshua Tree National Park, world-class shopping and dining in Palms Springs, and the Mojave National Preserve. The grounds of the hotel feature beautifully manicured cactus gardens brimming with desert plants, vintage signs, hand-welded metal sculptures, pieces of Americana, and cool found art. The Mexican hacienda-style cabins all have a common Southwestern color palette, modern amenities that include full kitchens, and furnished private patios under shady pergolas. Sunnyvale Garden Suites Hotel 29 Palms is only minutes from the north entrance of Joshua Tree National Park in Twentynine Palms, California. 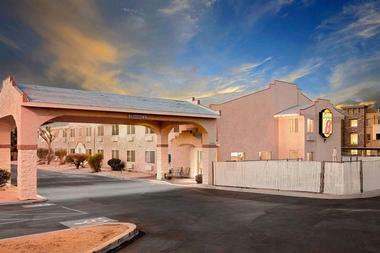 This all-suite hotel provides condo-like living and unrivaled comfort in this high-desert mountain location. Guests will appreciate the hotel’s close proximity to attractions like the Cleghorn Wilderness Area, the Old Schoolhouse Museum, and the Mojave National Preserve. The suites feature an eclectic mix of early 20th century and modern furniture, full kitchens, full private bathrooms, and modern amenities. 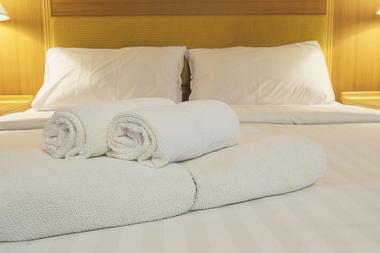 Hotel amenities include an outdoor whirlpool, fitness center, laundry facilities, and a large patio area with a BBQ. Incredible adventures await travelers near this charming Yucca Valley, California, hotel. Situated along California Highway 62, the Super 8 Yucca Valley hotel is only 5 miles from majestic Joshua Tree National Park. Guests traveling to the park will experience some of the finest high desert scenery, world-class climbing, and spectacular hiking there is. The rooms are spacious and have a Southwestern desert color palette, mahogany furniture, and large picture art featuring Joshua trees on the walls above the beds. The hotel also provides complimentary Wi-Fi, a daily complimentary breakfast, and a sparkling pool for their guests to enjoy. The Desert Lily B&B has garnered lots of attention since its opening, including from Sunset Magazine, Fodor Guides, and The Lonely Planet. 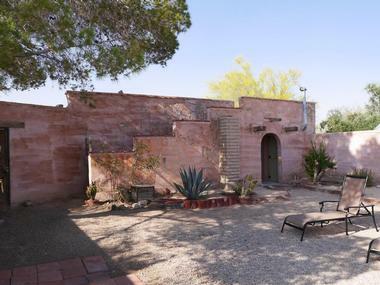 This delightful high desert bed and breakfast has lots of treasures around the property for curious guests to stumble across. There’s the B&B’s lovely bottle art, a wind sculpture, and a fire pit with plenty of seating. Guests could also find themselves relaxing in a hammock reading a book or enjoying a glass of wine under the starry sky on their comfortable patio furniture. There is much to explore like Joshua Tree National Park, Palm Springs, the Cleghorn Lakes Wilderness Area, and the JT & S Railroad Museum. Guests will start every day with Desert Lily B&B’s sensational gourmet breakfast. This incredibly unique and charming Mojave Desert retreat is located a couple miles south of California Highway 62, surrounding Joshua Tree National Park’s Covington Flats entrance. Thunderbird Lodge Retreat is one of Yucca Valley’s premier lodging options for travelers looking to visit and explore Joshua Tree. Once inside the park, visitors will have access to some of the best mountain climbing, trail hiking, and bouldering there is in the world. The retreat’s style is eclectic with a mixture of mid-century and modern furniture and decor. All of the cabins have full kitchens, while most have Wi-Fi and are pet-friendly.